With 38 years of experience, Chris is a whitewater legend. Originally from England, his homebase is no on the Nantahala River in Western North Carolina. Chris uses his expertise to oversee our Paddlesports and Outdoor Schools programs. 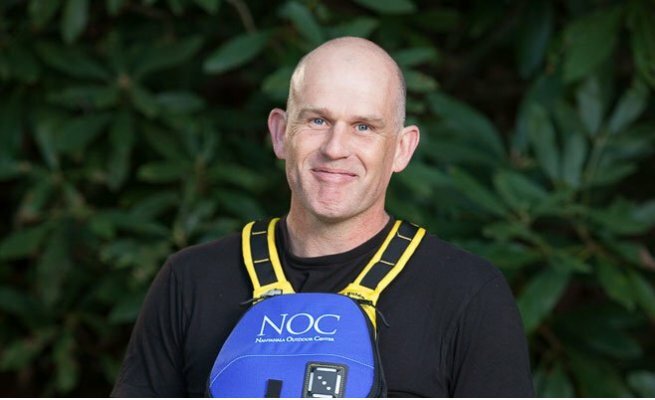 He is an integral part of NOC's kayak instruction, events, retail, adventure travel, the Nantahala Racing Club and NOC's outdoor professional training departments including SOLO Wilderness Medicine, Wilderness Survival and Swiftwater Water Rescue. Chris does it all. Including paddling – paddling extremely fast. One of Chris's greatest accomplishments has been moving to the US. He now represents the USA Wildwater Team in multiple national and international whitewater racing competitions. Although he bikes, swims and competes in triathlons, Chris' favorite activity is paddling. You can even watch him paddle upstream, called attainments, in the evenings after work.